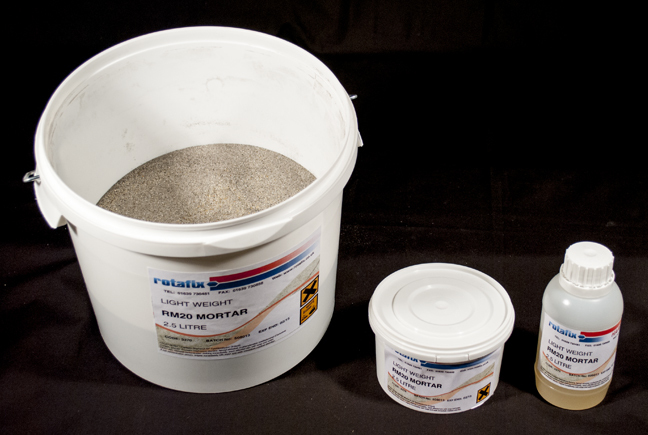 Rotafix RM20 LW is a lightweight concrete repair mortar which is suitable for repairs to reinforced concrete structures. Rotafix RM20 LW is suitable for vertical and overhead applications as the consistency of the mixed product gives very little slump when applied. Prior to the application of the mortar the surfaces should be coated with Rotafix P12 primer to improve adhesion and to prevent corrosion to the metal reinforcing bars. A maximum of 50mm can be applied per application. Rotafix RM20 meets the test requirements of the Water Research Council standard BS6920 for the storage of potable water. Flexural strength 17 N/mm² . Specific gravity 1.27 at +20ºC. Standard colours beige/grey (colour matching service available for stonework). Chemically resistant – unaffected by a wide range of industrial and domestic chemicals.